But better. A lot better. A couple weeks ago when Presto was stuck inside due to weather, he decided to take his angst out on the wooden support structure in his stall’s run. He’s not the first to go for those things, but he went at it pretty hard and heavy there for a few days, despite having a huge pile of hay to eat. Bored Presto is Bad Presto. Michelle tried spraying the wood with all the different things known to man to deter chewing. Presto is a) smart b) not a quitter, so he figured out that if he could just endure the flavor long enough to lick it off, his problem was solved. Eventually she wrapped all the wood in a few layers of chicken wire, and that finally put a kibosh on the chewing. The wood beams were saved, and now turnout is possible again, so it’s not such an issue anymore. Presto will likely find himself stuck inside again at some point though, with winter coming, and I’d rather he not find other naughty things to eat or do. He has a Jolly Ball, which gets played with a little bit, but it’s not interesting enough to keep him truly entertained. He hasn’t been super impressed with the big horse sized ball either. His diet is very very very carefully managed and balanced, so I don’t want to get him any of those stall toys with treats or food either. Plus he’s so smart I don’t think those would last long anyway. I’ve heard of different homemade type horse toys, involving milk jugs or soccer balls or ropes… has anyone made anything like that before? Did they work? Or are there any horse toys out there on the market that helped at keeping a particularly smart and hard to impress baby horse entertained for more than 5 minutes? I’m right here with you since (hopefully) the other colt will be leaving the farm before winter and Joey will need something to entertain him other than food. I’m waiting for Black Friday to hit RW’s toy section pretty hard. I want the giant ball. Luckily Joey doesn’t tend to be destructive, and he has a lot more turnout than Presto. I’m definitely getting Joey one of those itching pads to see what he thinks, and I already have a himalayan salt block on a rope for him too. I’m interested to see the ideas people give you! How about a traffic cone? I haven’t had much luck with jolly balls (thankfully my dogs LOVE THEM), but my guys have always loved to pick up cones whenever they were in the ring so I’m pretty sure they’d play with them in the paddock (or stall if I had stalls). They’re soft so probably not dangerous either. They always seem to go for the ‘boring’ stuff like traffic cones, rubber feed pans, etc. We had a milk jug with rocks in it tied to the fence with a rope at one point for the horses at our last barn that got bored, and they played with that a bit. Maybe you can put some of his daily grain ration in one of those treat balls that slowly dispenses the food as they roll it around? Good luck! Be grateful that your horse is under a year old and this behavior is to be expected (maybe even a little acceptable? ); I have a 7 year old that claims to be SO SO bored all. the. time. I do use some of the food toys (can’t use lick-its; one bite and its crushed in a matter of seconds and happily eaten of the ground; has to be a hard-as-rock Uncle Jimmy’s Licky thing grain ball AND attached to the ceiling so it can’t be pinned up against a wall and make it easier to eat. I limit his time with these to 4-8hrs per day and can get a week out of one. They also offer a sugar free flavor which makes me feel a little better, though RW doesn’t carry the sugar free which is a bummer, but Big Dees does. ) Can you try suspending a jolly ball, treat-less toy, etc from the ceiling? I just hang with baling twine so it breaks if needed, but something about the swinging seems to be fun. I’ve also given my horse dog toys and he will happily play with those as well. I had a tough stuff nylon one that he would pick up and throw or paw at, though the squeaker did surprise him the first few times. I also managed to leave a saddle pad within his reach and that was pulled to the ground, pawed, and completely shredded, so turns out saddle pads make great toys too (maybe something more cost effective like a towel could even work?) I’ve also seen my horse chew/eat/play with brooms and fly masks – did I mention he was 7?! For a mouthy, bored horse, I’ve found that nearly anything can be a toy. Really comes down to finding something that won’t make a mess or pose a potential choking or safety issue. Dayum!!! He about gnawed through the whole thing!! He has a whole ‘nother real horse to interact with, the turd! The empty plastic gallon jug was good for frustrations for my horse on stall rest, although he was so brutal with it, it was hard to listen to. He massacred/flattened that jug. Be sure and remove the cap – I was too dense to think of that and he popped the cap off and ate it with great relish. Mine also liked things he could chew thoroughly with his back teeth, which is what happened to the plastic bottle cap and several other items that were not chew toys. What about those rubber chicken dog toys? Like in the video of the colt playing with the chicken? Maybe Presto would like that LOL Or maybe a squeaky squirrel? Hahaha you MUST video that! I’m not sure he would eat them, he’s not really into treats yet. Maybe soon though, now that he’s legit weaned. i know! take him home and let him play with Gremlin!! 🙂 ha no help on toys the only ones Remus likes are the ones YOU EAT (Hence he only gets them in the winter when he can have some extra calories)!! My horse and his neighbor will play tug of war with a Jolly Apple for hours – it’s on an old lead rope and one end is clipped to the support beam between their stall doors. A shatterproof mirror is a big hit, too. Omg. Pig chews wood when stalled, too. It’s not even a frustration thing so much as just straight boredom. I could never get him to quit with sprays, and no amount of toys would keep his interest. The only thing that would help was the ability to stick his head out of the stall. Then he’d just chew on the stall guard and make faces at people/horses. The chicken wire is brillz, though. Kudos to Michelle for that bit of quick thinking. I took a water jug like you have in an office, and hung it with a lead chain. So many horses loved that thing, always wrapping it around their neck or pushing it with their face. I second that big treat ball from riding warehouse! We would feed Siggy in that to keep him entertained when he was on stall rest after colic surgery. He found it very entertaining! 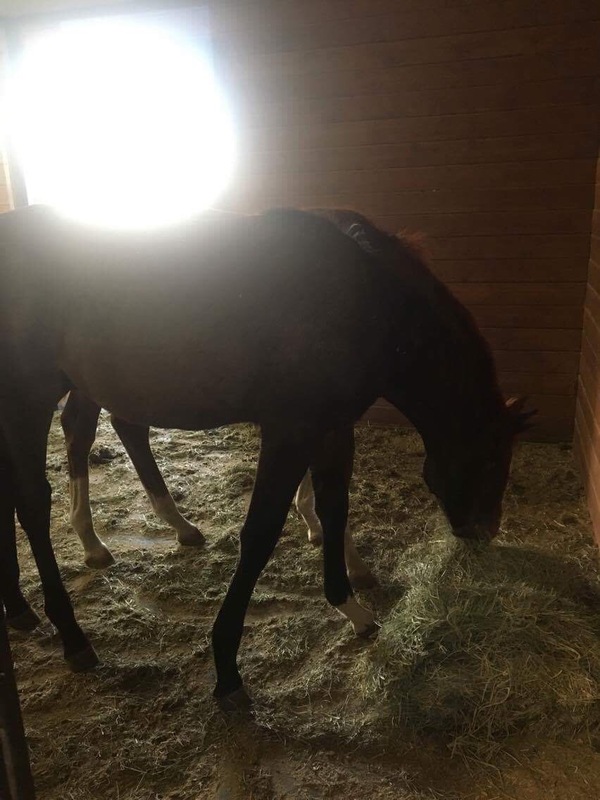 When both of “our” brown thoroughbreds where still here I would freeze a water and carrot juice mix block of ice (a gallon milk jug work great) with a rope through it (like the pink salt comes with) and tied it where they could lick on it and it saved lots of wood. It worked especially well when Charlie was having a panic attack when he had to do stall time. I didn’t read all do the comments but Henry likes to be annoying with stud chains with his mouth- so I took one and looped it around the bar and he can jiggle and clang it all he wants. He also likes the pick up and bang the stall door chains with the rubber around them – maybe hang one of those? I have a rubber antler that’s actually a dog toy but Catalina loves it and I find it all over her turnout. It’s made by Kahoot’s. One of the many times that Rio found himself on stall rest for an extended period I got him one of those giant rope toys they make for huge dogs. I left it loose in the stall, but you could probably hang it up if you wanted. He had a great time throwing it around and chewing on it. But you have to stay alert, those knotted ends really hurt when they whack you with them.